I did hear the music of National Anthem before. After the movie, I had found out Whitney Houston's incredible powerful voice in the recording of that song. Her Welcome Home Heroes concert with HBO for the soldiers fighting in the Persian Gulf War and their families made the whole nation feel proud of her. Her concert gave HBO its highest ratings ever after that! Many records of hers not only rocked the music world, and also introduced me into her music world! Since then, I realized I became a fan of hers. I started paying more attention to other kinds of music besides classical, like jazz, blues, etc.. 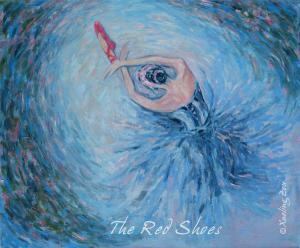 This painting was inspired by "The Red Shoes", which was first introduced to me by my mother. To me The Red Shoes has become a symbol of a career woman who has devoted her life to her job, or made some sacrifice in life. I painted this piece with my love for my mother. I slowly understand her more and more day after day. Happy Mother's Day! She was beautiful and talented in theater arts, dancing, singing and acting. She was chosen to be an actress in a couple of movies when she was very young. Then she became a principal opera singer (western style) preformed on the main stage for a couple of years. Her beautiful voice and emotional expression touched millions of audiences back then. In her late twenties, she went back to school to learn to be a journalist. She remembered people's names and phone numbers instantly (she never needed an address book). Also being an excellent ball-room dancer, she could grab the important information she needed for her report the next day, whenever she danced with the VIPs. 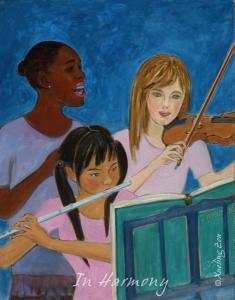 In her career, she always tried to focus on the arts. She wrote, edited thousands of reports, stories about so many artists, including our national treasures and international famous ones, published and broadcast that reached millions people in China and overseas, through newspapers, magazines, books, radio and TVs etc.. Back in the 1960's, she was one of a very few female journalists to interview the most famous Russian (Soviet Union at the time) ballerina Maya Plisetskaya when preforming in Beijing, China. That was before I was existed. After my father suddenly died in an accident when I was ten, it was not easy for me to see her world from my perspective. Quickly I learned how to take care of myself. No matter how late I tried to read my books to keep myself awake, not many nights I could see her before going to bed. Instead of having a regular breakfast like most people, I saw her notes left on the dinning table "food in the refrigerator" constantly. So many times I needed her signatures on my home works, but I had to learn how to fake them. How many important decisions the school teachers wanted to know our parents' opinion, I had to pretend my owns were supported by my mom. How could I bother her much, since her night light on her desk was on all the time, sometimes till I went to school. Instead of drinking coffee, she just chewed the coffee beans to continue her overnights work. She has been retired for many years now, but she still writes, and travels even though her health is not in a good condition. But she must watch news every hour, must read newspapers ever day... My biggest expenses used to be the international phone charge, listening to her endless interests of updated news, for which I never cared much, but I missed her and I had to learn how to deal with it. It was one of the greatest honors to become one of the most contributed women. Each of the contributor's portrait was published in postage stamps in China a couple years ago, including my mother's. Now, I feel proud of having such an extraordinary career mother, because I am part of her life, we all work hard and do our best in life. Sorry that I lost some of your nice feedback/comments on "Mexican Door 51" which I loaded here yesterday. "This happens if you have two of your galleries open at the same time in two different browser windows and are trying to edit both galleries simultaneously. You are going to have to remove all of the duplicates on your own or just delete the galleries and rebuild them. Sorry for any inconvenience." 1st of all, I never left the 2 different browser open when I upload my new images, or keep other opening etc. I learned a hard way when I just started loading my work began in the middle of June 2010. 2nd, I tried to delete one of the copy image by myself inside my own account, both of them were gone. So, I lost many nice feedback. And I have to reload my work again. Today is Friday, I hope that they really can help me to find a better solution soon. Struggling through the whole weekend, finally I finished Petko's portrait based on the only one picture I have ever seen of his - his FAA avatar. I hope it could express my thanks to Petko who had made an eight minutes and fifteen seconds long animated slide show with a beautiful music of my oil paintings on Youtube. After I did a search, and I had found out that I was only the one of one hundred eighteen FAA members Petko made such a wonderful work for! Being an artist, I really admire his great work through his FAA online gallery! 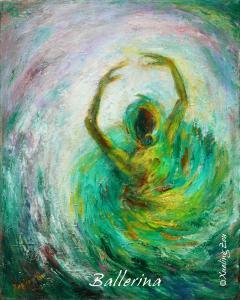 His painting style is bold and energetic, really represents his passion and devotion to art and to other artists. 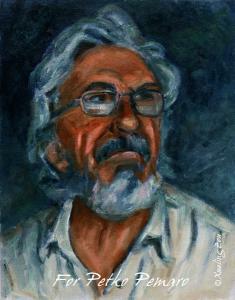 Now, I feel that I have discovered his incredible soul is much bigger than ordinary artists. I do need some more English language to help express my respect, my honor and my great thanks to him!! I believe that we all should be aware of the online scammers from all kinds of perspectives. I hope this site has the best the security, because our personal information is stored there, especially because FAA has to keep our credit card information for automatic account renewal purpose. I just want to share this article which talks about an Australian woman who turns the tables on Nigerian scammers! 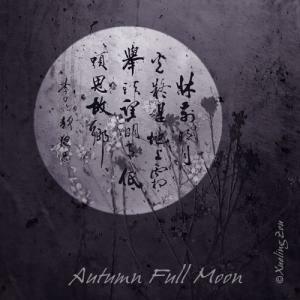 Born and raised in Beijing China, studied and lived in Australia, Hong Kong, Singapore, traveled to many counties in Asia, Europe and South America and now I have lived in Silicon Valley for over 11 years. I am always interested in different cultures, different people and different food, no political interest at all. 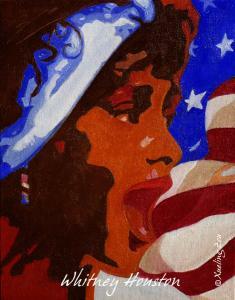 America, is one of the biggest countries with multi-cultural identity and we all admire it. If we only could understand each other from the one universal language - Love; if we could treat each just only one race - the human race. But now in the 21st century, I would never have thought I could be so confused by the question of race in the art world. Here is where my confusion comes from. Being FAA members, we all know that we can "Favorite" other artists' work, and make a "Watch List" for the artists whoever we like simply by clicking the buttons. One day, I received an email from a FAA member, from the portfolio photo I could tell that this talented artist was black. In the email, this artist was not happy and question about why I didn't have any black artist in my Favorite area. Back then, my favorite paintings were more than 30 pages, not mention English is my 2nd language, I am from a different culture. Some artists didn't used their face as the portfolio photos either. And when I see beautiful work, I just click the button, who would pay too much attention for the background? So, I explained to this artist. The email response back to me again was why I did not put any black artist on my Watch List since I was involved into some black people's art projects. Oh well, I didn't know my Watch List was so important and was being investigated. So, I took the wise advice and found a couple of my favorite black artists and added them into my Watch List. OK, peaceful for a while. 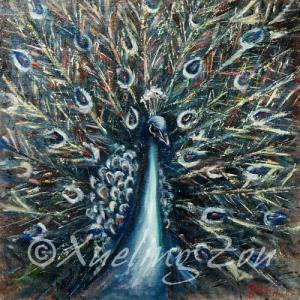 I just love to paint and contribute my artistic expression to the public. Interestingly I noticed a "Black is beautiful" ( I really believe so) contest was almost closed. I quickly added a couple of my portraits of black people to the contest. Very soon I received an "Urgent" titled email from the Contest Administrator who was white too, mentioning very politely that I wasn't qualified for this contest because I wasn't black. Sure, I removed my paintings since I might have misread one important rule "Black artists only". After, I saw a couple of Indian artists were still in the contest I wondered who are they, are they called black from their genetic anscestory? How odd I thought, that a white contest administrator would display a sample painting created by a white artist, for a contest in which only black artists were allowed to participate. Well, rules are rules which human beings make, and we'd better follow them to help us not get into any trouble in our society. At the same time I think "wait a second," this is America which is one of the main countries to protect Human Rights and thinks of itself as setting a good example for the world. Do we have to continue purposely separating ourselves by race? We all know that we should learn from some miserable mistakes in the history, so why do some people still have the race division so strongly in their minds, even in the art world? But who am I, where should I belong to, do I have to only paint landscape which is the safest subject? Is that all just because I am not black nor white??? I've been around. I believe a majority of people can live together and get along peacefully! Please don't take my post the wrong way - I just want to share my little thought. This is one of my first paintings from when I started almost 10 years ago. I aimed to capture the old Beijing culture with an old man and his bicycle. Typically the retired people enjoy hobbies like carrying pet birds in cages to nearby parks for a morning walk, Chigong, chat, chess game with others... Often they would carry small radios to listen to their favorite channels playing Chinese operas, traditional novels or historical stories. Afternoons would pass with a nap in the park or sitting out enjoying sunlit porches. 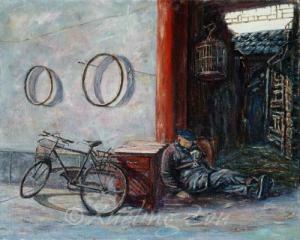 My painting expresses a moment typical of a day like this in Beijing where I was born and grew up.